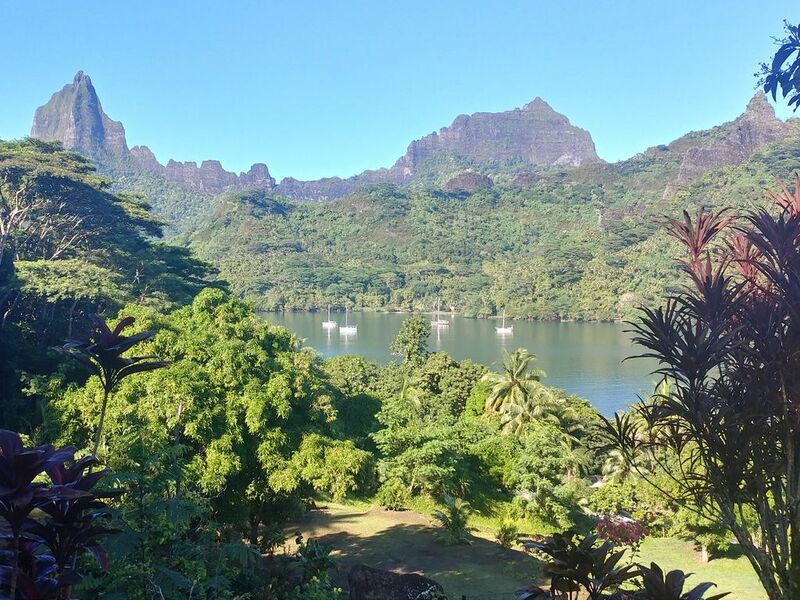 Nestled into a lush hillside, Fare Marama is a beautiful private home, offering magnificent views of Opunohu Bay and the surrounding mountain peaks of Moorea. The home consists of 2 bedrooms, 1.5 bathrooms, living room, dining room and kitchen. There is a King sized bed in the master bedroom, a Queen sized bed in the guest bedroom, and a trundle bed (twin size) in the living room. The home can sleep up to 6 very comfortably. The main bathroom has a large double shower, 2 sink vanity, and toilet. A half bathroom was added to the home in 2016, and is located off of the master bedroom. The kitchen was completely renovated in 2016, and is fully equipped and also has new appliances, new cabinetry, and granite counter tops. The kitchen, dining and living areas are all part of one great room, which offer vaulted ceilings and a beautiful view of Opunohu Bay. A wrap around deck with a table & chair set, 2 loungers, and a gas BBQ, are also available for your enjoyment. The deck is the perfect place to enjoy the incredible views from the home, while enjoying your favorite beverage or dining al fresco. The private yard surrounding the home is mature, with a variety of island plants, fruit trees and flowers. You will find ceiling and floor fans placed in all of the rooms, to catch the island's breezes. A television with DVD player and a selection of movies (in English) are available in the living room, along with a few games. There is also a docking station in the living room, to enjoy your favorite music. The house is equipped with a full size washer and dryer, and all bath towels, beach towels and linens are provided. There are also four snorkel sets, beach mats, a beach umbrella and a cooler available for guest use. Wifi/Internet is also available at the home free of charge. However, no telephone service is provided. A unique feature of the home is that it offers both 110V and 220V outlets. Which makes it very convenient for our U.S. guests to charge their various electronic gadgets. There is a full time care taker, Jacques, who lives in a separate cottage on the property adjacent to the main home. He can be most helpful with questions about the home and Moorea during your stay. The closest beach is a short 5 minute drive from the house. This beach will give you access to swim in Opunohu Bay which the house overlooks. Groceries and restaurants are a 10 minute drive from the home. Please no pets and no smoking. I fell in love with this property and home when I first saw it in 2008. However, it was not for sale at that time. In 2015 the stars aligned, when we discovered that the original owners were ready to sell. The rest as they say is history, and we feel so blessed to be the owners of this lovely and unique home. We stayed for two weeks at this amazing, beautiful home. The pictures do not do it justice, there aren't enough words to describe the breath taking views from all around this house. The inside as well is even better than pictured, with an open space from kitchen to living areas that look out to the bay. The kitchen is a cooks dream, stocked with all the utensils you could need. I could go on and on but as you can tell by other reviews you will not be disappointed if you choose this home to rent. It can be daunting to rent from afar, unsure what you will find when you arrive. Book this home with confidence, trust the owners you will not be disappointed! Veia was so patient with many silly questions, most would have been answered at the house but there were things I wanted to know before arrival. The property manager and care taker also great with questions and had helpful tips for around the place. Staying on Moorea was like a small step back in time. Very quite, family orientated locals, not commercial at all except by the resorts. Was glad to find no crowds of rude tourists in a hell bent hurry. Things are slower here, including the lazy dogs crossing the road on a hot afternoon. (watch for them when driving!) Please take some time to learn a little French and Tahitian! Please and thank you go a long way in any language!! Of the things to be prepared for in the tropics you have mosquitos, with the sunscreen you need to buy, be sure bug spray in on your list as well! Coming from a winter climate the heat and humidity slowed us down for a couple days. There are great fans to keep the air moving, and learn to close the sun shades across the sliding doors before the sun comes around. That really helps keep the house cooler in the afternoon! All said I would definitely recommend this home for a stay on Moorea! We hope to go back again next year!! Views are amazing. Home had everything we needed. Tom the property manager showed us everything. Washer and dryer a big plus for multi week stay on the Islands. I lost one of the snorkels and it took some effort but was able to find one to replace it. Super U for shopping was a few minutes drive away. It was a great experience. The location is very private, and we found everything we need in the house. An amazing stay! We toured the island with our rental car. The octagonal home is one-of-a-kind in French Polynesia. The views are spectacular and the deck is nice, but the mosquitos are not. There is snorkeling gear available in a closet, but it was not mentioned in the description. Lack of a/c and the need-to-be replaced exterior doors were the only downfalls. The caretaker, Tom, was nice and quite informative. It is probably one of the nicer private homes to rent on the island. Great house in a great location. Owner is very responsive and accommodating. Overall a great place to stay. Thank you for taking the time to write a review of the home. I’m happy to hear you enjoyed your time on Moorea and at the house. This property is an experience in itself and there were times we didn't even feel the need to go out because the view is so incredible! Beautiful house, all clean and updated and comfy. The VIEWS will blow your mind! It's tucked away on a hill and is very private. The groundskeeper was very nice and the property owner gave us plenty of information beforehand on how to find the house and get in, it was all easy and stress-free. This place was especially great because we went during the rainy season and there were a couple of rainstorms that were so beautiful to experience from the big windows in this house. There was WIFI, the outlets were compatible with our American devices, there were DVDs to watch when we just wanted to relax at night. I can't think of anything I would change about it! The island is great, definitely go to the Lagoonarium and check out the Belvedere, and I highly recommend renting a car. Eating out at restaurants is expensive, but we knew that going in and didn't really mind it. Motu Iti is awesome because they feed the sharks and rays right out front and they just kind of hang out there so you can watch them while you dine! We also tried out a place that was just basically a guy with a barbecue and a tiny building with some tables out front, and that food was SO good and much cheaper than a restaurant. Everyone on the island is extremely friendly, we always felt safe, and it was just the most beautiful place. Highly recommend this VRBO! Wow, thanks so much for such a glowing review of the home! I'm so happy to hear that you enjoyed yourself both at the house and on Moorea! I loved your comments about liking the experience of the passing rainstorms from the house, for that is something I've enjoyed when I'm on Moorea. Moorea is a truly magical place. Perhaps we can welcome you back someday. Rates are subject to change, until the reservation is confirmed.